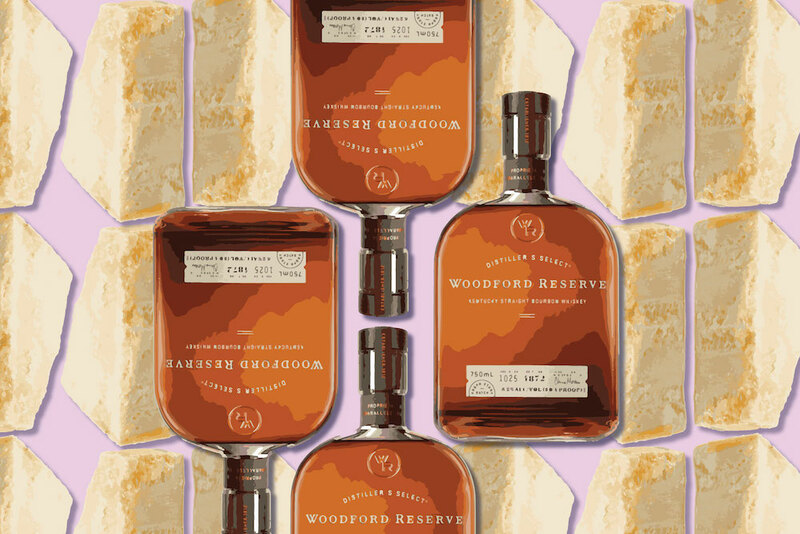 Southern cooking is having a moment. It’s a cuisine that has deep roots in America, and great historical impact, but you could argue that it got derailed somewhere in the last few decades. Its main ingredients have often reflected what was abundant and inexpensive. When the South was an agrarian economy, that meant vegetables and whole grains. But as cheap commodity food penetrated American society, it really took hold in the South (think packaged and convenience food.) Sadly you'll still find more canned and frozen food than fresh in many parts of the South to this day. But Southern food is rising again! And it’s not one size fits all. There are several different takes on it and all of them aim to be true to the history of the cuisine while also making it more relevant for today. Here are three recent examples in cookbook form. 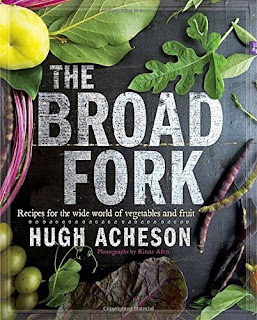 The Broad Fork: Recipes for the Wide World of Vegetables and Fruits is written by Hugh Acheson, the award winning chef and restaurateur, and Southern transplant. 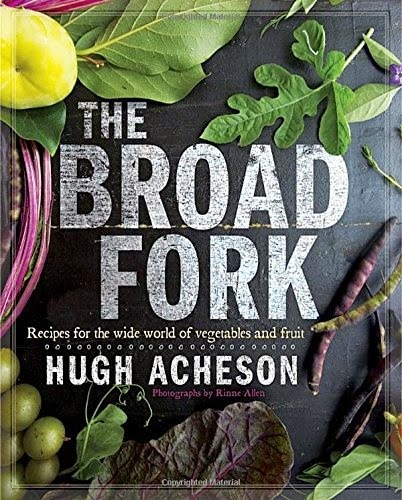 Sometimes it takes an outsider to truly appreciate a cuisine, and Acheson immerses himself not just in the ingredients, but in traditional cooking techniques like pickling, salt curing, fermenting, stewing and even using a pressure cooker. While not explicitly about Southern food, there is no denying that for all practical purposes, Acheson is a Southern chef. He shares the most trendy of recipes like salt and sugar curing egg yolks and foraged ingredients like nasturtium leaves, yacon and fiddlehead ferns. He also uses ingredients that are not traditionally found in the Southern kitchen; from preserved lemons to miso and galangal. I can’t even begin to tell you how this collection runs the gamut from deeply traditional recipes like Southern Artichoke Dip and Corn Spoonbread to wildly original ones like Sautéed Carrots with Pine Nuts, Malt Vinegar and Sorghum or Pickled Pepper and Feta Salad with Chickpeas, Olives, Raisins, Orange, and Mint. This book is a keeper and a solid reference book you will turn to again and again. Lighten up, y’all: Classic Southern Recipes made Healthy & Wholesome is the latest cookbook from Virginia Willis, a classically French trained chef from the South. 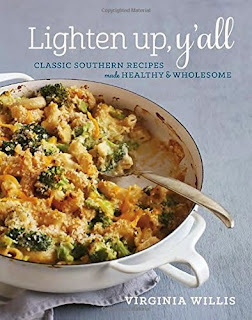 I’ve been a fan of Virginia Willis for some time, and in this book she revises recipes and shares the results of her experimenting in the kitchen to capture the flavor, without all the calories, of some of her favorite dishes. While it would easy to take obvious shortcuts to reduce the amount of fat in a recipe, Willis carefully finds her own ways to preserve the flavor while shaving off calories. She is the first to admit when a substitution doesn’t work and refuses to sacrifice good taste. From her Hot Mess Spinach and Feta Dip to Pulled Pork Tenderloin and Multigrain Pecan Waffles, her recipes are appealing and not complicated or cheffy. 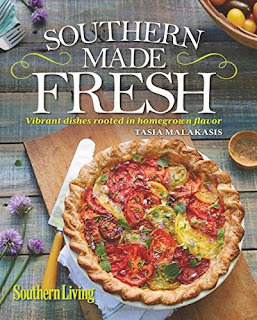 I’m not going to give away the secrets in the book, but I will tell you it’s worth buying just for recipes for Old-Fashioned Buttermilk Pie and Collard Green with Chipotle Potlikker. This book is also a keeper. Southern Made Fresh: Vibrant Dishes Rooted in Homegrown Flavor is another “fresh” approach to Southern food. While I love abundance as much as the next person, many of the recipes from author Tasia Malakasis feel over the top to me. For example, a kale salad that serves six people and calls for one cup of Parmesan cheese just seems excessive as does using three whole avocados in a spring greens salad for six. On the other hand some of the recipes are so simple they barely needed including at all, like Grilled Peaches or Heirloom Tomato Bruschetta (is there anyone who doesn’t know how to chop tomatoes and basil and put it on bread?). There are also a lot of recipes that really don’t connect to Southern cuisine for me such as Sardine Rillettes, Spicy Ginger-Chicken Lettuce Wraps or Mushroom & Chicken Meatballs. The most appealing recipes are ones that use Southern ingredients in a new way, like Collard & Black-Eyed Pea Soup, Pasta with Green Tomatoes & Goat Cheese or Lima Bean Hummus. I'll let you decide if this book deserves a spot in your collection. For me, it's a pass. Disclaimer: These cookbooks were sent to me for review purposes. This post includes affiliate links. I was not paid to write this or any other post on Cooking with Amy.